L'article a été vendu.Cet article a été vendu pour CHF 1'456.00. 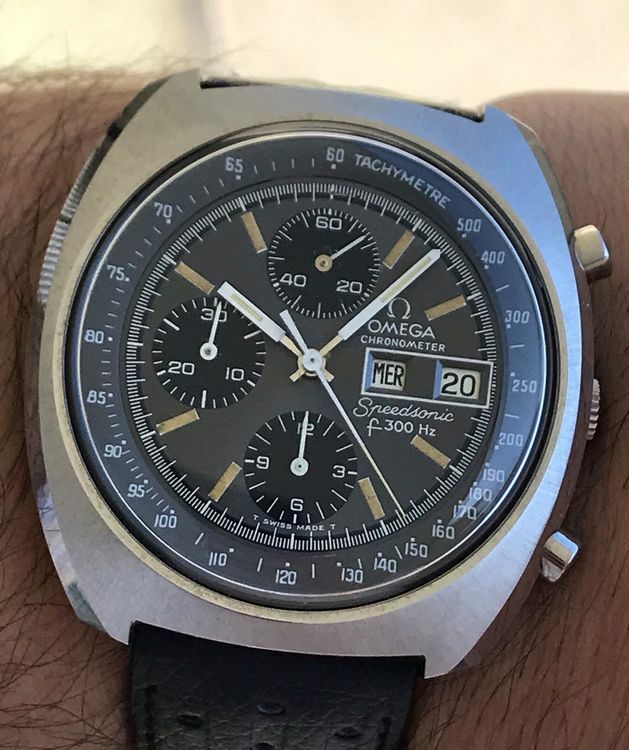 Rare 1974 OMEGA Speedmaster SPEEDSONIC! Chronograph Tuning Fork! Calibre 1255! Mint Condition! Top! Very nice and all original vintage 1974 OMEGA speedmaster speedsonic mens chronograph watch! The watch is unpolished with a massive stainless steel case of 43mm diameter and with screw back. Super nice and great condition for a vintage 70s watch. Please refer to clear pictures. Really top condition! Like new and all original vintage parts! Running perfectly and keeping accurate time. New battery! Electronic f300Hz chronograph movement OMEGA calibre 1255 with day-date. Stuning original grey dial with nice patina tritium indexes! Comes on its original vintage black corfam strap and vintage original OMEGA buckle. The watch is guaranteed original and authentic OMEGA swiss made product.